From head, round and oval shapes which we use to make one, this week we can move to rest of doll’s body parts and shapes used to create them. Looking at picture, it looks so easy and simple, right? It is that simple as it looks! And you still wonder why can’t you make your own doll? Lets see if this lesson will help. As you could see from above picture cylinders are the shapes used to create all other body parts, beside the head. I find cylinders brothers of round shapes. Either they are older (wider) taller from our round, or are younger (more narrow) taller from our round. The way we started the round is the basic of any other crochet piece we’ll work on. It is always the magic ring or the chain. Magic ring will shape your ends in more round shape, while chain will create oval start and oval shape of your work. slim and tall ones will be the ones you start and don’t increase or increase one round and continue with repeating rounds for desired length fat and short or tall ones, will be the ones you will work same as round shape, or oval, but then instead of making round, and repeating middle session for few rounds, for the cylinder you will have to go double and more (depending how long one you’re making and what it’s purpose will be). 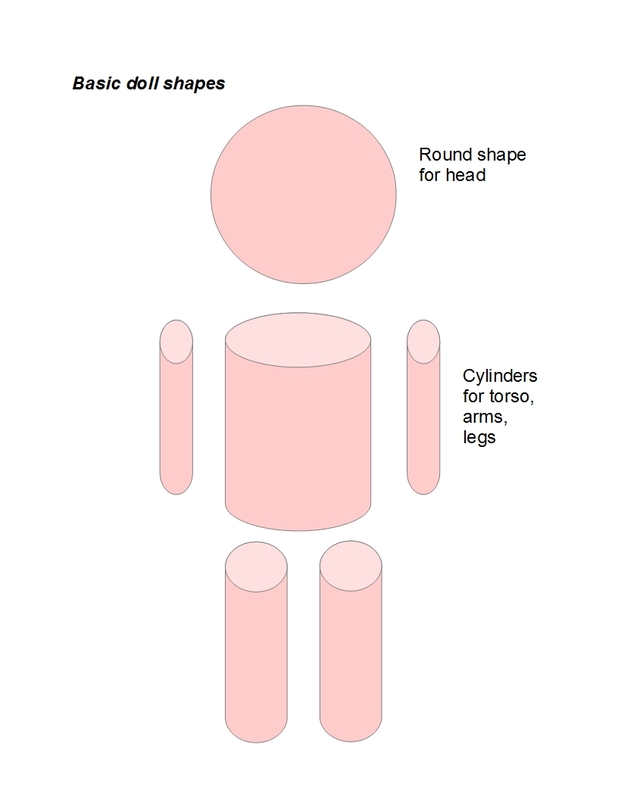 Cylinder shapes are used for arms, legs and torso. When making arms and legs in simple cylinder shape it is very simple task to do. With just few stitches and repeating rounds you will create little arms and legs in no time. Here are few samples I made, different stitch counts, but yet tried to work through all of them we used in our first lesson. On this photo I skipped 3 and 4 stitches, as they are really rarely used for arms or legs. Three stitches in repeating rounds are very difficult to work, almost impossible even for experienced crocheters. Four stitches are not impossible to make, but are rarely used and I skipped them gladly. Four stitches and long repeating rounds of them are used when making tails in small amigurumi animals, or, sometimes, when making fingers on your doll’s hands. On below photo I made 10 repeating rounds of 5, 6, 7, 8, 9 and 10 stitches I started in magic ring. Difference is obvious and for such a small pieces there is not much to say. These are all suitable for small doll arms and legs. Adjust the length by repeating rounds and you will have your doll arms and legs done in no time. (for cylinders 8, 9 and 10, I actually started in ring with 4, 6 and 5 sts; increased first round to desired number of stitches and continued with repeating shape. That gives me possibility to close magic ring nicely). Let’s see what happens with the torso. Torso will require few more increasing rounds and let us see what is happening with cylinder shape there. Same method you can implement if making bigger doll and with it bigger arms and legs. Torso, together with head, makes one of the largest body part. We will not use blue prints of human body and actual proportions to make doll’s torso, but we have to picture and decide of it’s size, compare it to the head before we start crocheting. For that, the best is to keep picture or drawing of a doll you wish to make. This way you can keep track of what you’re doing and test your progress, compare it with your design as you go. You don’t have to be good at drawing, simple sketch will be enough. Maybe your hand doesn’t cooperate with the brain and eyes when drawing, but based on this drawing your brain will cooperate with you work and make things much easier for you. Give it a try. Draw your doll the best you can and try to follow it as you crochet. For torso, same as for arms and legs we will use cylinder shape again. I made two little samples I started with 6 stitches in magic ring. One is done with 10 repeating rounds between increasing and decreasing ones, and second with 15 of them. In between I placed round little one, with just 5 repeating rounds so you can compare the sizes. I can’t give you magic formula on how wide and how tall to make doll’s torso. This is what makes all this designing and crocheting interesting and diverse. My lessons I started with rounds and ovals or the head shapes, as most of dolls start from the head. Once you have created and have size of the head you like, the rest of body parts will be easily made in order to match you head the way you wish. For creating body, same as with arms and legs, make a base. Increase several rounds, but keep in mind not to make body larger than the head. If using same stitch count as one you used when making the head, stop increasing at last two rounds. This will make your body fit nicely to your doll’s head. This is some ration most designers use when making “normal” proportion dolls. I say normal as there are chibi dolls with extremely big heads and tiny torso, arms and legs, dolls in between chibi and normal, normal ones have head somewhat bigger but still remind on traditional doll shape… Whatever doll you will make, keep in mind to make body less wide than the head. Even though the simple body can be done with easy and simple cylinder shape for most of you it will not be satisfying. Then these tall brothers we work on will call few relatives for help. Simple cones will make nice ears to your animal toys, but you will hardly use exact cone shape on your doll. Instead you need to understand how they are created and how to add them into your work. Cones are done by simple, even increasing or decreasing round followed by one, two, three and more repeating rounds. On what stitch number you use when increasing or decreasing, followed by how many repeating rounds you work, will determine how narrow and how fast your cylinder will be, and what shape it will get. On above photo I have made cones with one repeating and two repeating rounds in between even increasing rounds. Cones are started (from left to right) with 3, 4, 5, 6 and 8 stitches in the magic ring. If you increase or decrease each round your crochet work will have the shape of round, same beginning or end we talked about in our previous lesson. It will be nice and round. Adding round or two rounds in between each of increase/decrease, you can shape your work to more cone looking piece. It is still simple shaping, but this way you can form chest and neck area more narrow, or play with shape of your head, arms or legs. There is no formula or recommendation on how many repeating rounds to use in between your increasing or decreasing rounds. This really depends on what you are after. If you are novice and just learning how to make a doll, and wish to use cone shape to finish your dolls body, use the same stitch count on decreasing rounds as you used for increasing ones when starting the body. Count rounds!!! That is essential! Compare the body length to your head (assuming you have done the head first). You don’t want body to be too long. If you are working after blueprint (picture or drawing, try to make comparison based on that). Taking all these parameters in mind, count how many rows will you come up with if you repeat one round in between each decrease, and how many will give you two repeating rounds. These all matter and these are all the things you have to be aware of and pay attention to when making your doll. Below are few photos to show you what will happen with your round or cylinder when decreasing on top of your work. I tried to join two crochet pieces, round and cylinders adding the cone on top of them to show you what you might expect from your work. But to get familiar and to understand exactly what are you doing, you will, again, need to practice. On above photo you can see what will happen if you start decreasing and repeating one round after you repeated only 5 rounds of the middle part. This example shows work started with 6 stitches round and 6 stitches cone. This would make nice body shape. Above photo showing little round started with 6 stitches, 5 repeating rounds in the middle and cone with two repeating rounds between decreasing rounds (of 6 sts). What do you think? If you ask me, I think it is too long on top. Each one works fine, don’t you think? At the end, all will depend on the size of ones head and the rest of the body (arms and legs) but 1 decreasing round with one repeating looks very nice to start with when learning the basics. Just to compare, I added 2 repeating round cones to same cylinders. Same as with round, even here the top seems too long. But this is not all. All above examples showed you when you try to finish one piece from cylinder to cone shape using same stitch count on decreasing rounds as you did with increasing ones on the bottom. Don’t forget that you can mix and match all of them. You can start with 6 but gradually change to 8 and finish with 4 stitches decreases in cone. Or any other way using any other stitch count in your work. This was just one little example on how it looks when 6 sts round shape and 6 sts cone work together. And again I remind you to practice! This is the only way to get to understand all this and understand your work. By the end of this week I will try to finish one simple doll, based on these first lessons we made, to show you on exact doll sample how it all works. While working and showing you on doll sample will tell you more about round shapes used on doll’s hands and how to make them. Feet and shoes we’ll leave for some other time. For now we keep on the simple! Until next lesson keep on practicing and happy crocheting! QUE BIEN SABER LO BASICO , GRACIAS ! ESPERAMOS MAS TIPS !! !